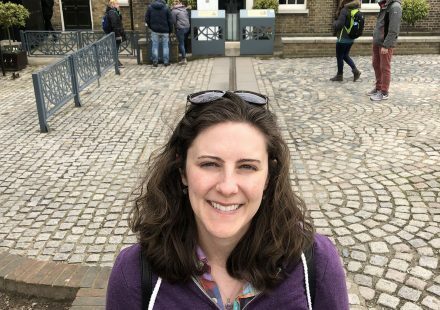 Like any dedicated mapmaker, visiting the Royal Observatory at Greenwich and the Prime Meridian were at the top of my tourist to-dos on a recent trip to London. Today, the Prime Meridian is located in the yard of the Royal Observatory at the top of the hill in Greenwich Park. One can look “down” the marked line, due north, and take in the National Maritime Museum and Queen’s House, the Thames, and London shimmering in glass in the distance. I found the view incredible, especially on a rare, sunny March day. But the Prime Meridian itself was a bit of a letdown. Sure, it’s neat to straddle the line and have a foot on either side of zero. And yeah, its cool to stand at the precise longitudinal location from which time was standardized. But it’s really just a metal ribbon slicing through an old stone courtyard. However, if one turns around and glances back at the Observatory, things start to get a little interesting. Due south of the Prime Meridian, just a few feet—I mean about a meter—away is a great big telescope, the Transit Circle telescope constructed by Sir George Biddell Airy in 1850 to be exact. Airy’s Transit Circle telescope was used to precisely measure the movements of stars as they crossed the Prime Meridian. There is another telescope to the left of Airy’s, and then another smaller, older one. Following the view of these earlier telescopes toward London back into the yard, one’s eye catches another prime meridian to the west of the Prime Meridian and yet another stone marking yet another important meridian to history. Each of these meridians were used to chart stars and measure longitude and time. But with each new telescope, more precise and accurate than the last, the Prime Meridian was pushed to the east by a few yards (meters) as the building was extended to accommodate the latest equipment. I was struck by how arbitrary the location of the Prime Meridian is. 0˚ is located at the top of a hill outside of London because it was convenient for an astronomer of history to put it there. The world decided that this line, several iterations after the original, was the Prime Meridian at the International Meridian Conference in Washington DC, in 1884. Adopting the Prime Meridian as an international standard allowed for time to be consistent amongst nations and made maritime charting and navigation more accurate. Then a third truth struck me. Standing with feet on either side of zero, I checked the GPS on my phone, and it placed me ever so slightly to the west of 0˚. Apparently, the Prime Meridian as marked isn’t even the Prime Meridian anymore. It was moved unceremoniously about 100 meters to the east based on standardization of Earth’s geodesy in 1984. It was yet another arbitrary move; although, probably even more math went into this adjustment than Airy’s original placement of his telescope in 1850.